By agreeing to the work to be completed as shown on the Quotation you are agreeing to these terms and conditions. 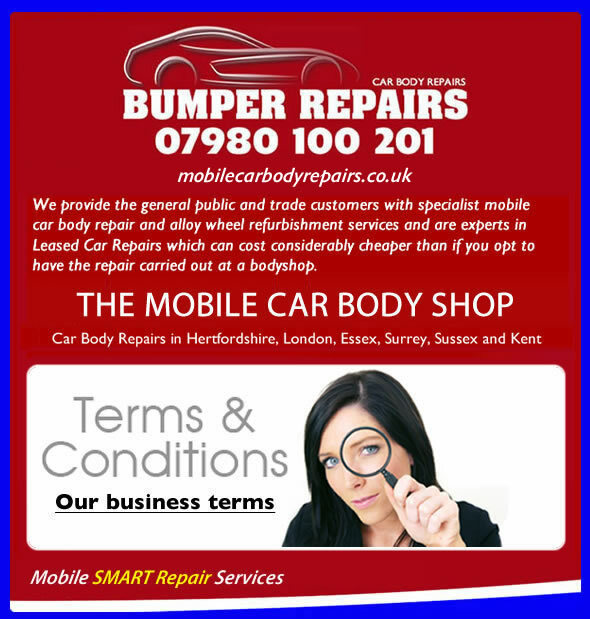 We, Us refers to the company Car Body Repairs Ltd trading as Bumper Repairs. You, refers to the client. Estimate, refers to the verbal estimate. We may provide You with a verbal estimate before the vehicle/damage is seen and this will be made on a worst case scenario, where upon receipt of pertinent pictorial and/or descriptive information, a formal fixed price quotation will be issued by email to the customer. The Quote prepared by Us is an offer to repair the damage indicated on your images at the price stated. The customers agreement, however stated, to proceed with repairs constitutes acceptance of that offer and forms a binding legal contract incorporating these Terms of Business. If for any reason, including but not limited to variables such as the weather, We are unable to carry out the repair at the specified time or location indicated on the Quote, any and all liability incurred by Us as a result shall be discharged if we make an offer to conduct the repair at the Quotation price on an alternative time or location convenient to both parties, whether or not such time date and location is identified or such offer is accepted. Repairs may be completed at a location agreed with the customer, or at a location nominated by us. We have absolute discretion to decide on the location for the repair. This decision may be changed, including on the date of the booked repair, as variable factors including but not limited to weather and available light affect the decision. If we decide that the repair should be completed at a location other than that originally envisaged, the customer authorises us to instruct a third party to move the vehicle to such an appropriate location. Removal and return of the vehicle in these circumstances will be a service that may be provided by Us at no further charge, dependent on the particulars of prior agreement within the Quotation. We require a repair location where the customers vehicle and the repair operatives van can both be parked safely and conveniently and next to each other. Most repairs will be completed within a few hours or the same day. However, we reserve the right to return on another day, usually the following day, if necessary to complete the repair. Quotations are typically only valid for 7 days, however a fixed priced quotation may be reopened upon our discretion. We undertake to carry out the repairs indicated on the Quotation. If it becomes clear during the work that, in the opinion of the repairer, further work is necessary to properly complete the repairs outlined on the Quote, the customers authorisation and agreement will be obtained before any further work is undertaken that would increase the price shown on the Quotation. If such authorisation is not forthcoming at the time or at a later date, we reserve the right not to continue with the repairs or any processes that require further work to be completed outside the scope of the original schedule of repair work. In these circumstances the full Quotation price remains payable by the customer. Further work that does not increase the Quotation price may be proceeded with without the requirement for customer authorisation. No repair will be identical to an automotive factory finish, which is machine-sprayed to tolerances beyond human capability. Hence no repair will ever be as good as new. Bumper Repairs discharges its obligations under any repair agreement by providing a high quality, hand-completed aftermarket repair. In normal circumstances, such a repair is very unlikely to be detected by a casual examination of the vehicle by an untrained observer unaware of the previous damage location. It is the absolute responsibility of the customer to advise Us by way of images or video, any vehicle / alloy wheel damage they wish us to assess for the purposes of providing a fixed price quotation. It is also the absolute responsibility of the customer to advise Us, of any non-original finish areas on the vehicle. In case of incompatibility with a non-original finish (whether or not notified by the customer), We have the right to void this contract in these circumstances, We will not be obliged to complete or rectify any repair and We have the absolute discretion to request or discharge any liability in relation to the Quotation that You accepted. Bumper Repairs are entitled to subcontract out work to or engage on behalf of the customer as agent such third parties as we see fit to meet any service requirement that falls outside of the scope of our normal service operation or service coverage area, as to meet demand and ensure customers obtain professional and seamless continuation of mobile car body repair service. If We attend onsite on our agreed booking date and our vehicle technician determines that the repair cannot be completed to a level that we are happy with, due to the scope of work materially chaining we shall provide You with a refund for any uncompleted repair. We offer a 12 month warranty. This is a formulation and application guarantee in that the finish will not degrade due to the paint being improperly mixed or applied by Us. The guarantee is applicable to the original Bumper Repairs client only and is not transferable under any circumstances. Future damage to the same area or failure to follow the care instructions provided by Us will invalidate the warranty. Any repairs to rust or stone chips will NOT be guaranteed or warranted. If rust or stone chip repairs are taken on it is on an attempt to improve basis only and no assurance is made or implied that these types of repairs will be invisible or will last the length of the guarantee. We offer a 12 month formulation and application guarantee on our work aside from when we are dealing with any rust damage or touch in repairs, if at any time a claim is made on the guarantee we will come out to you to redo the repair or offer a refund if we are not able to offer a rectification. If for whatever reason you decide to take the car to a third party to rectify a repair we will not be liable to any cost above the invoiced price of the repair. The repaired area must NOT be washed or polished for a minimum period of fourteen days following completion of the repair or repairs. This is to allow the exterior paint finish to fully cure and harden. We advise against the use of pressure washers/steam cleaners or mechanised washing appliances or booths, as these can diminish the repair and would void any guarantee placed upon your repair longevity. Unless agreed by prior arrangement – our payment terms to secure a booking allocation is by way of full payment of a generated VAT invoice prior to our attendance onsite at your nominated service repair location. We ONLY accept Debit or Credit card payments and dependent on what method you use, a card processing fee will be incurred. When larger payment amounts are due, BACS transfer can be accepted using our business account details. Please note– we do NOTaccept cash, cheques, PayPal or Western Union. If after booking a service repair with Us and You wish to cancel the service appointment, we require at least 3 days prior notice, failure to do so will lead to a cancellation fee of £50. Bumper Repairs will under no circumstance be liable for indirect, special, or consequential damages including any loss of business, revenue, or profits, arising from the work carried out, or delay in providing it. Any remedy for loss or damage claimed will be limited to the work being corrected, or a refund of sums actually paid for the work. Nothing within this Agreement will operate to exclude any liability for death or personal injury arising as result of the negligence of Bumper Repairs. This Agreement will be governed by the laws of England and any user of our business website ( mobilecarbodyrepairs.co.uk ) hereby agrees to be bound exclusively by the jurisdiction of English courts without reference to rules governing choice of laws.